Coffee, Cats & Retail: Have You been Watching The X Factor 2012? Have You been Watching The X Factor 2012? This season of X Factor has been phenomenal. Of course there is a few things I wouldn't mind changing. For one, I'm really am not a fan of the auditions taking place with an open audience. X Factor audience tends to be a little too loud and rambunctious for my taste. I liked the quaint touch as was seen on American Idol. This was not only less intimating for the contestants, it provided more focus on the judges. I feel they were far more straight forward and entertaining in this small environment. Plus, there's plenty of time for an open audience. 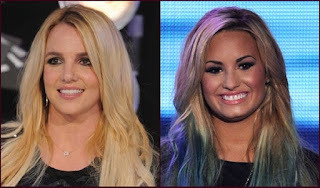 Britney Spears and Demi Lovoto Join our beloved permanent fixtures; L.A. Reid and Simon Cowell. What do we think? Although Britney could of easily of been the inspiration to the show's inception, she still remains a shadow of her former self. With that said her judging is concise and usually on point. On the other hand Demi comes across as an insolent ten year old that offers very little except a bevy of meaningless words and tantrums. Khloe Kardashian and Mario Lopez comprise a cute team as they supply a little well-needed organization to the show. Some amazing folks this year, but as to be expected the strongest don't always generate enough votes. Such was the case with Wednesday's episode, when the very talented Paige Thomas and Vino Allen were surprisingly sent home. Premature departure of Page and Vino; two amazing talents. It appears that cyber-world and the judges were equally as shocked with the early departure of Vino and Paige, while the far less talented, drag queenish and third-rate cabaret act Ce Ce Frey remains. Why? Because Ce Ce is generating the "vote for the worst" vote. If only the powers-that-be at X-Factor were aware of what goes on in cyber world, then just maybe they would do the honorable thing and over-ride public votes. I think we all would prefer to see deserving folks remain in the competition. No one with any self-respect would want to win a competition by generating the worst vote. It's not fair to all involved. My top faves to win are Carly Rose, Tate Stevens and Diamond White. Whether they win or not I'm sure these folks are destined for big careers. What about y'all out there, who would you like to see win the X Factor and walk away five million dollars richer? also how do you feel about folks voting for the worst, let me know in the comment section. I'd like to see Diamond White win. Yes I have been watching X-factor, I am routing for Carley! I want Beatrice to win. I have not been watching. I've watched a few times. I think Kloe is a bad host, she seems nervous. I don't watch it, so I have no opinion about winners. No, I don't really watch TV. carly rose! when i first heard her during auditions, i knew she'd win. i knew that for melanie amaro too. Sorry, no. I don't watch this show. But thanks for this giveaway! I watch every week and I think Carly Rose is the most talented. Have not been watching. But I always mean to! I don't watch it, sorry. Carly Rose..! !She's amazing! !Thanks for this giveaway..!! I've been watching and I'm rooting for Emblem 3. I think Carly Rose has the best voice. I have been too busy so haven't watched this season. No - I don't watch it. I haven't been watching X factor. So I am not sure who I would like to win. Not been watching - too busy. I haven't been watching, but I'm not a fan of "vote for the worst" -- to me, it's fine to dislike a reality competition show, but you should at least leave the voting to the fans who become pretty invested in their favorites rather than try to rig the outcome. I think voting for the worse is more funny than anything. It is proof that these shows need to do more to make sure that the winner is based on talent not popularity. I started watching the X Factor this season. I really like Carly Rose and Fifth Harmony. I haven't been able to keep up... I don't agree with ppl voting for the worst. The entire point is to vote for the best, so voting for the worst messes up the count...it also keeps people in who don't deserve it. I don't watch but I think that our young people are so fragile these days and that voting on the worse could have negative outcomes to there self esteem. I have watched in the past, I guess I think being the worst of the group that made it this far is still not bad. Not if they are purposely voting for the worst contestant. What that means is that better talent is being dismissed prematurely, and that in itself is defeating the purpose of the show. Sorry I havn't watched!! thanks for the contest! I don't watch the show but I think that the kindest person should win. I would really like to see Carly win! I think she is definitely the best out of all of the contestants! At first, I wasn't so sure, but I sure am now! I use to watch but am to busy anymore. I know when we use to watch American Idol cyber world would pick the worse and vote for them. I think sometimes it would work because somebody really good would go home. Our favorite from this year is Beatrice Miller. I think Disney should hire her and build a show around her like Hannah Montana or Wizards of Waverly Place. All the Disney Shows are just terrible now. My daughter said, "well, that's it for the Disney Channel. They have nothing left." when Wizards signed off. I really liked Page, but now I'm rooting for Carly Rose. I don't watch, and I think it's stupid to vote for the worst. Why not vote for someone that you actually want to succeed? My favorite is Carly Rose! I hope she wins! Wow i haven't heard that ppl were voting for the worst! I watched the show a few times but I wasn't too intrigued.